Today I am going to tell you about a miraculous product from Glenmark Pharmaceuticals Ltd. This I got for my daughter around 6 years back and have been using this since. My daughter had started to go to school and was exposed to sun too much which caused her some skin irritations. I got this cream after it was prescribed by my dermatologist for my daughter. Best suited for Dry skin/Dermatitis/Hyperpigmentation resulting from chronic exposure to allergens, irritants, environment changes, smoking or from skin problems in conditions like; Psoriasis, Atopic dermatitis, Eczema, Xeroderma & Ichthyosis. Lightens striae(Stretch Marks), Post-Acne scars, Post-Pimple scars, Freckles & other skin stains. Apply to the effected area as required. Use regularly. Specially recommended to use after washing, bathing. The product used to come in small white plastic jar type tub at that time. Now the packaging is changed and it comes in wide tub made of plastic. The cream is really thick and spreads easily. I have combination type skin and this cream has not broken me out yet. I applied this cream every night both on me and my daughters skin for 2-3 months and results started to show up. My skin used to look dull and dry which was now glowing with health. This cream definitely made my skin look firmer and even toned. I always keep a tub of this cream in winters and use it as night cream or mix this with my other night cream. In summers I don’t use it very much and avoid using it under my makeup. I have combination type skin and these all precaution I need to take. Other wise it might break me out as the cream is rich and heavy. Also, it takes some time to get totally absorbed in the skin because it is thick. It keeps my skin moisturized through out the day and ddoesn’tfeel heavy or sticky on my skin. Packaging – Wide tub type packaging which is a little bulky and habe screw open cap. Texture – Smooth texture that spreads easily but the cream is rich so it takes some time to get absorbed into the skin. Fragrance – No fragrance at all. Staying Power – Keeps my skin hydrated for whole day and I don’t need to reapply. Oily skin people might find this too heavy for their skin. Yes, I repurchase it every year and is satisfied with its performance. Hello , can I apply this cream in the morning insread of at night ? If no what is the reason ? Thanks , Mrs R Pakiam. This cream doesn’t have any SPF factor and is a little thick which will make you sweat and might result in pimples. Yes, It is a moisturizing cream with vitamin E everyone can use even children above 3+ years. But use a sunscreen with it when going out in sun. This product makes my skin too oily… what is the duration of this cream to see our result ??? Does this makes the skin fairer?? No it will not make your skin fairer as it not a fairness cream. It improves skin condition and cures dryness & patchy skin. 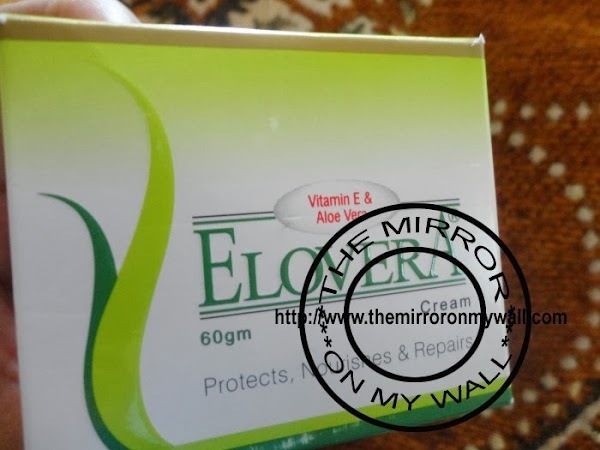 can i use this cream on treating acne or dullness of skin???? 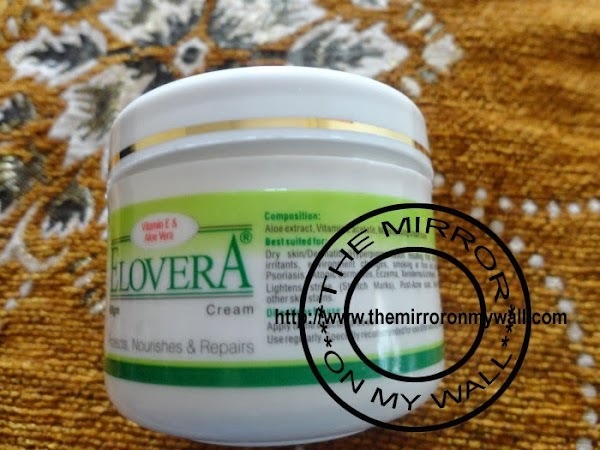 I use this cream mostly in winters as this cream is rich and thick which might break me out. I use more light moisturizers in summers. If you have oily or combi type skin I suggest use it only in winters. 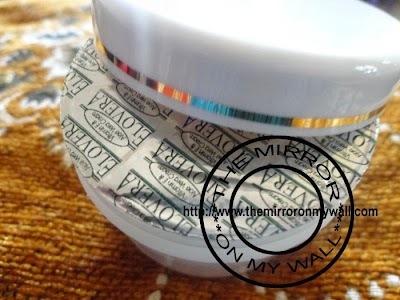 My skin is too oily with pimples ,so can I used this cream or not? if yes when do I apply it ?at morning or night?? This cream is not for oily skin people especially in summers as you may end up getting breakouts. You can try this during winters. when do I apply it ?at morning or night?? I apply it after facewash in morning and evenings. Use it as skin cream or as night cream. If you have oily skin then I would not recommend this to you. I normally use it during winters when I get dry and stretchy skin. Direction for use for cleaning pimple? 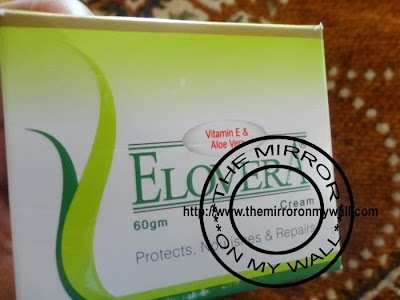 It is a thick cream if your skin is pimple prone I would suggest no to use this cream. 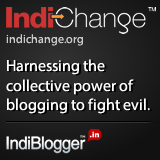 Thanks sridevi for sharing the link. I have started using it recently only..This was suggested to remove blackening of my feet and ankles in both legs owing to over dosage some medicine ( it was taken for 5 yrs instead of period suggested by the surgeon . I got a75g packing . Is it available bigger packing.? Hiya ! This little jar really works & it’s way better than all those cosmetic companies with their fancy tubes of lotions. Recently,I’d tried out a new soap (Goat’s Milk Soap) which promised to be organic. Needless to say it did not work, my face suffered a patchy redness breakout with tiny little boils all over it. It was so noticeable , people started commenting about it . 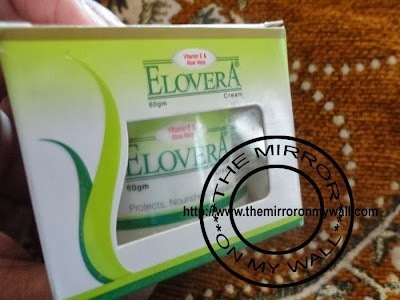 Finally , this Elovera cream came to the rescue ,though it did take around a month to work ! I have dry and too sensitive skin. 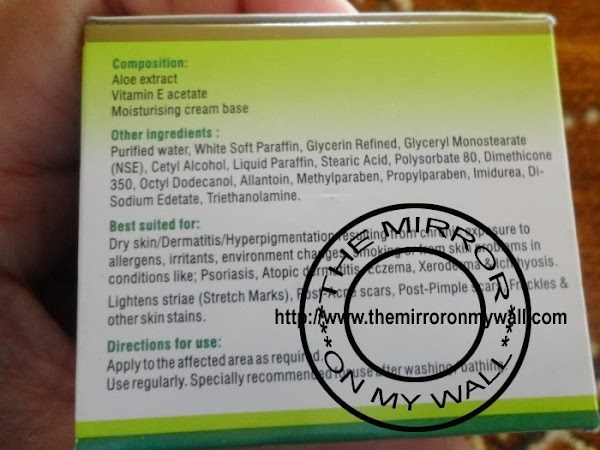 Can I use this cream as a moisturising cream daily in the morning after bath and also in all my face or should I use this only in night and also only in affected area . It takes about 2-3 months to show the result depending on the skin conditions and weather. I have dry and too sensitive skin. can I use this cream in the morning in summers after having bath as a moisturiser and can I use this in all over my face or should I use this only in affected area? Yes, I use it as day cream sometimes during winters. I haven’t tested on burn scars so won’t be able to comment on this. Does it work for burn spot? I had burnt from refined oil.. 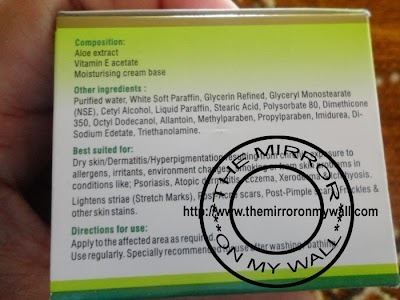 Please answer me..
Its depends on your skin type if you have oily skin then this cream will make it more oily resulting in pimples and acne but if you have dry skin then you can use it but just a little as this is very rich and moisturizing. Am gonna to try it first time. Am purchased it for my dark circle. Is that ok for it. Please suggest some cream for darkcircles around eyes.